Indy Winterfest 2015 is behind us, but is a very pleasant memory! Over 3000 distinct users checked in to the Untapped app alone and by our count 105 breweries shared beer. Spanning two buildings made plenty of room though lines at some breweries later in the afternoon were longer but moved well. What a way to start out the new beer year with a twice as big Winterfest! I was impressed last year as a volunteer seeing Winterfest move from the Agriculture building in to the Champions Pavilion but now with the addition of the Blue Ribbon, giving the event I believe twice as many people and 30+ more breweries it was amazing. I was, of course, one of the many volunteers working the gates like usual. I love going to festivals more as a volunteer even if it doesn’t give me a lot of time to drink beer, or get all the beers I want to try, it still is the best way to go. For starters, you get to check out everything before anyone is even there! Anyways, I am rambling; let’s go on with the beer. As breweries got set up I noticed a common theme amongst a lot of breweries, it seemed the big thing was bacon, bacon, bacon. Crown Brewing had a nice Bacon Coffee Stout. Wabash Brewing had their Bacon Face Brown. For a minute there I thought I was actually at Bacon Fest instead of Winterfest (Which btw, was an actual event going on the same day). I also noticed that I’ve been out of the brew scene for a while cause there were so many newer Indiana breweries that I had no idea about. 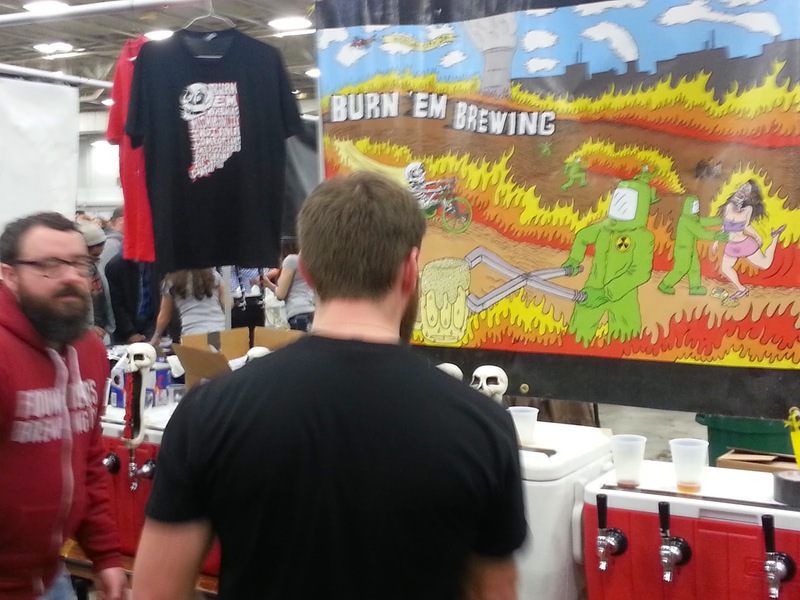 Basket Case Brewing, Burn ‘Em Brewing, and Wabash Brewing were just a few that were new to me. I didn’t get a chance to find Basket Case, but Burn ‘Em Brewing’s Red Dead ReVelvet was a nice red stout (I didn’t even know you could have a red stout). If only I had a Red Velvet Elvis Flying Cupcake at the same time, I probably would’ve been on cloud 9. 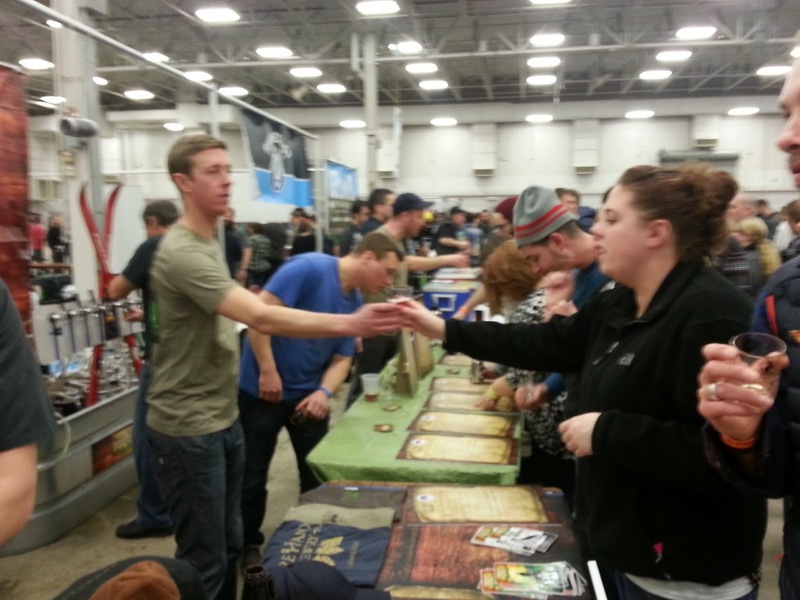 Before I get into some of my other favorites – I need to give a bow to Bare Hands Brewing Co. I believe they had a least 20+ beers.. at least it seems like it was that much. They delivered variety, great flavors and hands down the experience that I so love at a festival. They got me hooked with their PB Stout three Winterfests ago, and I love that they keep it coming. I loved the Coconut Chocolate Mail Order Bride RIS. 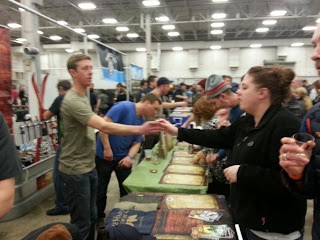 Big thanks to the guild, the brewers, and my fellow volunteers. It was an awesome event and can’t wait until the summer. 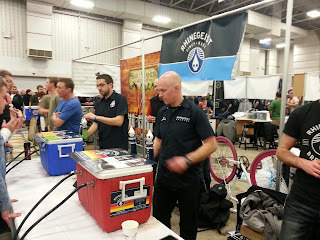 Andrew Korty is our featured guest blogger who is a BJCP National judge whose homebrew has won awards at the regional and national levels. 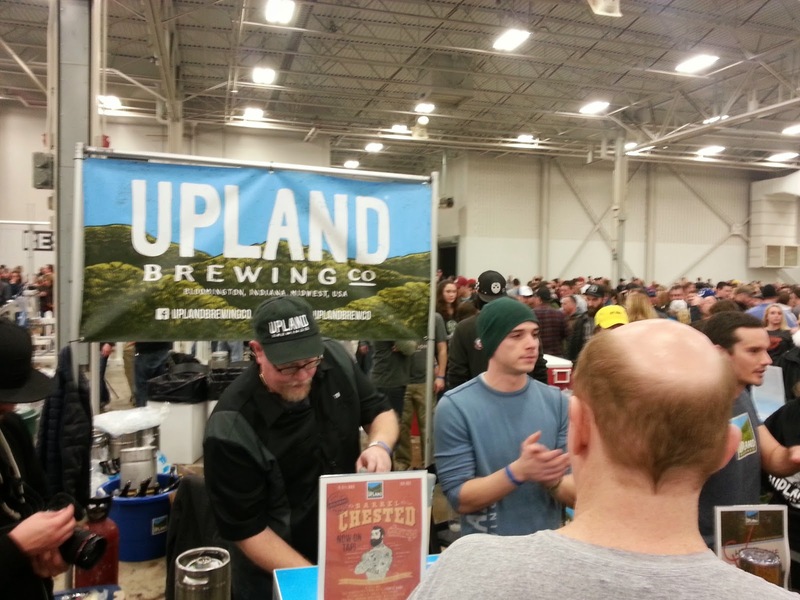 Winterfest stands apart from other beer festivals in the region, partly because is it so well organized, but mostly due to the diverse selection of beers. Breweries know that Winterfest attendees, rather than perfunctorily seeking anything with “IPA” in the name, favor the unique, the interesting, and the beer-geeky. Still, beers at this festival don’t make it on quirkiness alone. Quality is a requirement. Straight away, Shoreline treated us to a wonderfully complex, twelve-year-old barleywine whose nutty, sherry-like tones were the perfect antidote to the blustery cold outside. On the crisper side, their Bavarian Bombshell schwarzbier offered a clean Pilsner malt base with just a hint of dark malt. Apparently aiming for full-on zany, Evil Czech delivered an expertly balanced rye IPA with kale, jalapeÃ±o, and citrus zest, a combination I couldn’t have conjured up without several twirls of the culinary spinning wheel. They were also tipping cans of their General George Patton Pilsner, which brims with Czech hop character over a crackery malt canvas. Function had a solid lineup, including Kinetic, whose chili pepper aroma and flavor blend harmoniously with the malt and won’t scorch your palate. Their sessionable bitter was pleasantly British, evoking the expected hop, malt, and yeast notes. And over in the firkin tent was their milk stout, accompanied by just enough java to compliment but not overpower the malt flavors. The Dude from Crown Brewing is a porter brewed with a White Russian flavored coffee that really ties the whole beer together, man. I wish my special lady would have been there to enjoy it. I chased it with the deliciously bacony Hatchetation smoked strong stout. Venerable Upland continues to pleasantly surprise, this time with their Side Trail, a skillful blend of a roasty stout and a currant-infused Belgian ale. I also tasted their latest Blueberry Lambic, whose fruity, lactic backbone is sharpened up with just the right amount of acetic sourness. Grand Junction has been wasting no time building a new, hard-hitting lineup. Their Dark Road Porter is the best of the bunch and, to my taste, the best American-style porter in the region. The most impressive beer of the night was Daredevil’s JWP stout aged in a Buffalo Trace bourbon barrel. I tend to be pretty harsh on this style, as the booziness in most examples masks the complexity of the base beer. Not in this case—Daredevil clearly allowed only a passing acquaintance between bourbon and beer, allowing the nuances of the stout to play off the whiskey notes delightfully. 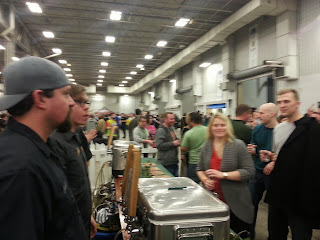 Every Winterfest I shed a tear for the breweries I missed, usually due to line length or poor planning on my part. 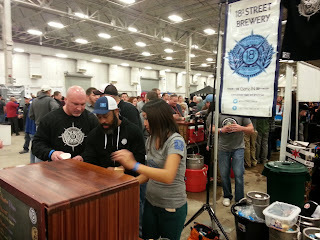 This year was no exception, and I returned home without a taste of the offerings from 18th Street, MashCraft, and several other of my favorite breweries. I console myself by reflecting on the highlights above, a list that seems to get longer every year. One of the best and most unusual beers for me was was from Bare Hands Brewery of Mishawaka, IN: Mole Mail Order Bride – a Russian Imperial Stout with deep dark malt that was aged on Mexican cinnamon with cocoa nibs and multiple Mexican style peppers. Bare Hands is well known for its Thai PA (IPA with Thai ). It also became well known in 2014 for the serious injury owner/brewer Chris Gerard suffered in the brewery. We are very glad to see Chris doing well and working hard again. With a focus on newer breweries, I finally caught up with Drew Fox who opened 18th Street Brewery in Gary in 2013. The 18th Street Vanilla Hunter is the sweet stout plus Mexican vanilla beans and really delivers the wonderful base of the stout and just enough great vanilla without overpowering. Drew’s concept, partly conceived when living on 18th Street in the Pilsen area of Chicago, is to brew a variety of beers. While Hunter Sweet Stout is close to a flagship beer, Drew has been bringing out varieties of Hunter from Vanilla Hunter, to Cherry Hunter, to Coconut Hunter. BBL aged Hunter will be out in April 2015. Taxman Brewing of Bargersville has been brewing in house since November, 2014, and Taxman Tax Holiday delivers an amber ale close to their quad with notes of molasses and nice spice. Their Winter Wit was a very nice lemon forward version. Mashcraft, Greenwood, featured a very special Mashcraft Ancho Annie pepper infused Amber. This provided tremendous flavor with a slight burn. No hops. Four Fathers Brewing of Valparaiso had a Fathers Beer, Belgian Pale (5.3%) that was very nice. Their collaboration with Burn ‘Em Brewing is Smoke That Shizz, and it is a complex Imperial Smoked Blonde Ale fermented with Honey. Really unique. Burn ‘Em Brewing opened in Michigan City in Feb. 2013, and their Long John’s On winter warmer really delivered a lot of flavor and warmth. Their Fallen Swine Smoked Pork Chop porter seemed to be a popular beer attendees were talking about. The Devils Trumpet Brewing Company of Merrillville, offered me Pandemonium in Purgatory Belgian Style Tripel (9.6%) that had nice flavor. New Boswell Brewing (Richmond) not only offered a deep roasty Skye Island Stout with coffee, but a thirst quenching Root beer balancing sarsparilla, sassafras, vanilla and spices. 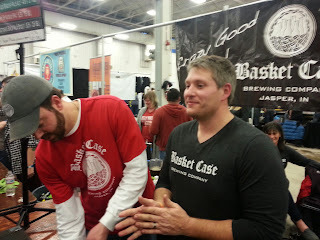 Basket Case Brewing operates within the Mill House Restaurant gave me Sgt. Pepper blond with scorpion peppers that had a great level of spice. Chapmans Brewing of Angola, had RIOS, aptly named as Russian Imperial Oatmeal Stout coming in at 9.5% alc but very smooth and creamy while being dark and delivering that deep dark malt flavor. Zwanzigz of Columbus brewer Mike Rybinski had promised me a few weeks ago he’d have some ‘good stuff.’ As always Mike delivers. Mike is already on the radar screen for the ghost chilli stout which we sampled before he brought to Winterfest about 3 years ago. In addition, this year Nullius in Verba (See for yourself in Latin) used 13 types of grain, 3 types of sugar, and multiple hops is a barleywine that defies explanation other than complexity of spices with so many dimensions of fruitiness, nuttiness, and just deliciousness. The barrel aged version did all of that with the vanilla and oak added. Daredevil (Shelbyville but soon to be Speedway) had hinted we’d get BBL aged Muse, and since I am hooked up with a major consumer of Muse we had to get our sample of this wonderful golden ale that adds the depth of the oak. I just had to get a sip of Daredevil JWP while stopping – the rich complex stout. Upland served me the Barrel Chested Barleywine adding the caramel, toffee, dark fruit flavor of the base beer with toasted oak vanilla from the barrel. Head Brewer Caleb also poured us some Dragonfruit sour – a highly carbonated, nicely tart beer that delivered citrus and green pepper and was almost like a delicious bubbly wine. Sun King Indy had Hot Rod Lincoln, the Barrel Aged Timmie imperial stout with cherries and chocolate. Flat 12 used a music and art theme while experimenting with their top notch Pogues Run Porter with different yeasts. At first I was enthralled with the Belgian yeast version but the Indiana wild yeast provided such an interesting tartness to the porter to sway me. Bloomington Brewing hooked me back with Ol Floyd’s Belgian Dark Strong delivering fig, plu, some spice while smooth for a 9% beer featuring a unique yeast blend this year. I want to give a shout out to three out-of-state breweries. Against The Grain Louisville has built from a small takeover in the L’ville Cardinals stadium, to serving nearly 20 countries in Europe, major metro areas in the U.S. and all with fun, sometimes funky, often BBL aged beers that we can love. Look for our brewer/owner buddy Sam to be featured on Brew Dogs TV in April. Sam Cruz is originally from and still lives in Indiana. Rhinegiest Cincinnati has Indiana roots in brewer/owner buddy Jim Matt who was QA at SunKing and moved around before settling in to one of the breweries that my craft beer friends always talk about in the Ohio Valley. Country Boy Lexington (KY) brought their beer to IN way before there was any hope of distribution here just because they are great guys and they want to share the beer love. 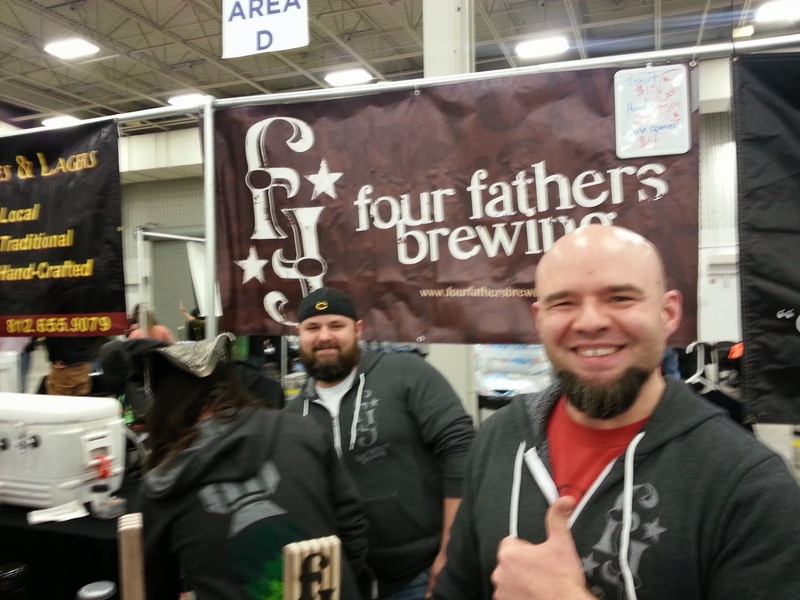 Brewer/owner Evan Coppage was on hand at Winterfest and chatting it up with our man Josh H who will have a new brewery open in 2015, just because brewers tend to stick together and share. CB partner DG was MIA and I mention not only because they brew great beer but because they are extremely nice people – who, by the way, can host one helluva party as I can well attest. All three of these breweries (and many more) are part of the wonderful family of local craft brewers who love beer, love the people and are most anxious to just share. Winterfest is a wonderful event — we only wish it somehow could be held on at least 3 consecutive days because it is impossible to try everything we want, or to just settle in and drink a couple of our favorites that we cannot get often. To all of our brewery friends who we talked with, took pictures of, shared stories with – THANKS for being part of one of the best and most open enterprises as a heart of America. 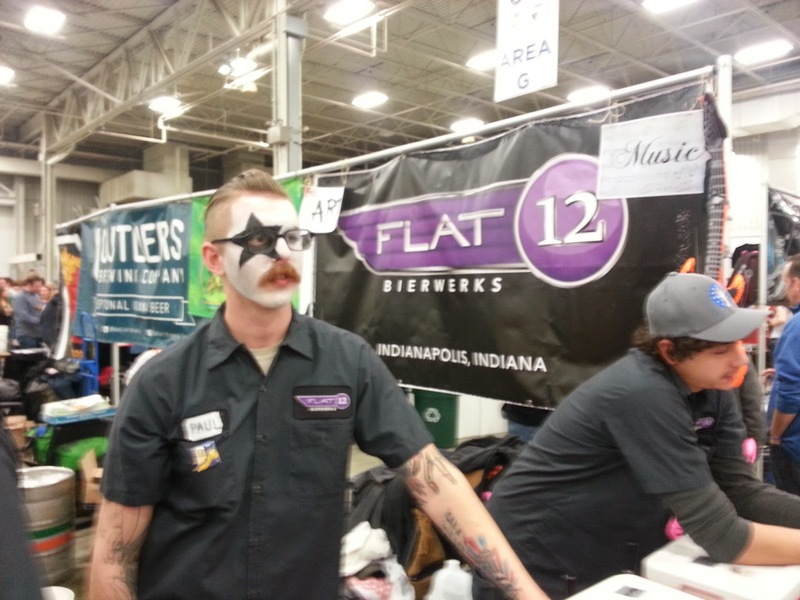 We can’t write about all of the wonderful people and post all 100+ pics we have of this year’s Indy Winterfest. 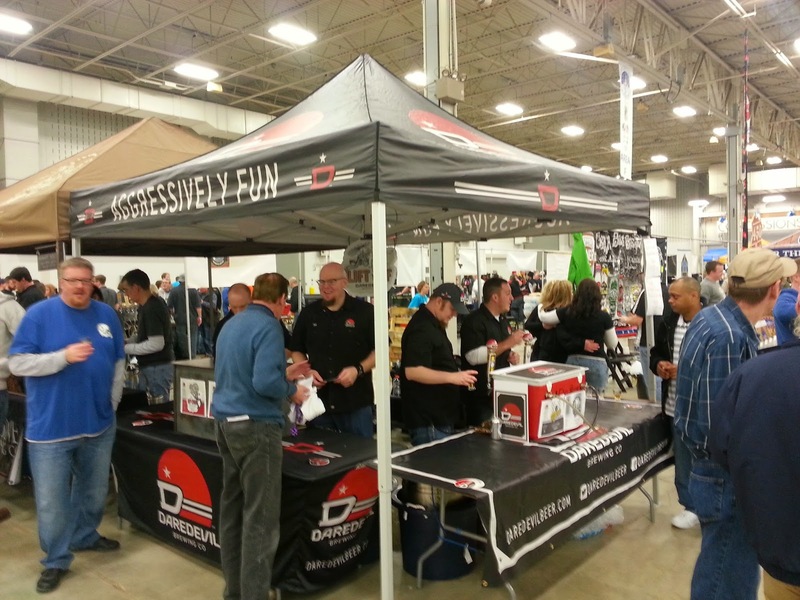 But Brewers of Indiana Guild, and all of the volunteers, police agencies, and many involved should feel very, very good about this year’s event! Thanks to all, and we will see many of you soon. This year’s venue seemed to provide more restrooms, more space, and a really fun atmosphere! Remember, there are MORE festivals coming up! Now that Winterfest is behind us, here was our post of what is coming just in the next weeks, and some beyond.